Produktinformationen "Marvin Test Solutions: MV-GX7944-2162048: 3U PXIe Single-Slot controller, 2.16GHz Core2Duo, 2GB RAM,"
The Marvin Test MV-GX7944 is a single-slot embedded cPCI Express 3U controller for use with Marvin Test Solutionâ€™s MV-GX7600 PXI Express chassis. When combined with the embedded storage peripherals of the MV-GX7600 Series chassis, it is the ideal solution for a compact, high performance, and integrated PXI Express chassis / controller configuration. The MV-GX7944 controller supports multiple peripherals and I/O interfaces through either the controllerâ€™s front panel or the rear I/O panel of the MV-GX7600 Series. Connection to the DVD-RW drive and hard drive is via the controllerâ€™s internal I/O interface. The controllerâ€™s front panel I/O is provided with a factory default configuration and is fully functional in any PXI Express or cPCI Express chassis. 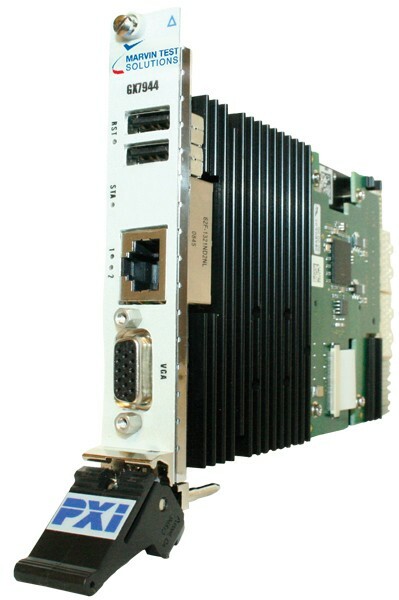 The Marvin Test MV-GX7944 embedded system controller adheres to the PXI Express and cPCI Express specifications and is PICMG EXP.0 R1.0 compliant. The Marvin Test MV-GX7944 series controller ships standard with Windows 7 Pro operating system. Please note that Windows XP Pro operating system is also available for this series, and should be specified when ordering. Weiterführende Links zu "Marvin Test Solutions: MV-GX7944-2162048: 3U PXIe Single-Slot controller, 2.16GHz Core2Duo, 2GB RAM,"